Home ⎢UK Cylinder Testing Protocols To Change? The UK recreational and technical diving industry is continuing to lobby against a forced change to a proposed ISO cylinder testing standard. Historically the UK cylinder testing regime for scuba tanks used to be every two years (visual) and every four years (hydraulic)—the cylinder is visually tested when it is hydraulically tested. This changed in September 2002, when IDEST (Inspectorate for Diving Equipment Servicing and Testing) was one of the parties that advocated that the hydraulic test period should be conducted every 2.5 years and a hydraulic test conducted every five years in the United Kingdom. In other words, the test cycle time was extended! Now, the United Kingdom is under pressure to amend this test cycle and bring in an annual cylinder visual test. However, the test specifications proposed are a retrograde step because they are not as rigorous at the current IDEST 30-month British visual. What is equally maddening to the UK diving industry is that there is no evidence that this change is necessary, nor that it will proportionally increase safety. In fact, many diving professionals and agencies worry that it will make diving less safe because a certain amount of cylinder filling will go “underground” as divers look to save money on testing. There is already anecdotal evidence on social media that divers will buy a personal compressor to avoid cylinder testing. The fear is that this new annual standard will put the divers at risk because there will be less adherence to the current inspection and testing regime. Divers will simply not get their cylinders tested. 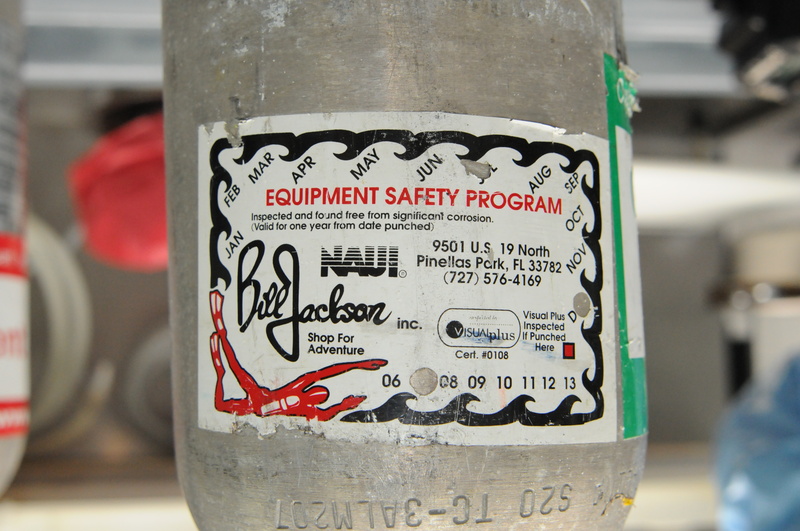 No one wants to be around a cylinder when it fails, and it is possible that when a cylinder is not inspected for a number of years that it will fail at some point—be it at a dive site, on a dive boat or in a car, when it is being transported. The proposed ISO annual test is an international standard and it is being applied to every cylinder across the board—from 0.5lt to 120lt—in every industry, from aviation and brewing through to cryogenics and dive centres. This new ISO standard that is being driven by a number of nations, including those that primarily dive with aluminium diving cylinders, where there have been issues with cylinder necks cracking. So let’s compare the UK IDEST visual test process against the US process. The cylinder is logged in on a job sheet. The boot and any stickers on the cylinder are removed. The cylinder is externally assessed for damage and corrosion. The cylinder is checked to ensure it is empty. If it is not, any gas is released. The valve is removed by a special jig to ensure that it is not damaged. The stem threads (the part that is screwed into the cylinder) and the outlet threads (where you screw your DIN regulator into the valve) are cleaned. Once clean, both the stem and the outlet threads are checked with a go gauge. If the go gauge does not go all the way, then the threads are inspected to to find out why this could not happen. The stem and outlet threads are then checked with a no go gauge. This should not go on more than one third on the threads. If it does, there is a fault with the threads and they are duly inspected. In the case that the valve passes the go/no go gauge test, it is then dismantled and put into a ultrasonic cleaner to clean all the parts. The cylinder is placed on a bench and inspected internally with either a drop light or a boroscope. If a drop light is used, then a dentist’s mirror is used to check the inside of the shoulder for damage, corrosion, or anything abnormal. The valve is washed in fresh water, dried and reassembled with new O-rings and white Teflon rings. The valve is then screwed into the cylinder and made “hand tight.” It is then torqued to the correct tension. The cylinder is stamped with the IDEST Centre’s unique stamp, including whether it has been visually or hydro-statically serviced. It is stickered to show when it is next due for service. In the States, cylinders are visually inspected only. Whilst the threads are closely looked at, they are not physically checked with go/no go gauges, nor is the valve always serviced at this time. It may be serviced. It may not be serviced. Unlike the United Kingdom, there are no set standards for cylinder inspection, other than that a hydrostatic test must be conducted every five years. In other words, in a typical US visual service, the valve is whipped off, a technician takes a look and puts the valve back in. It is a very basic inspection and does not remotely compare with the current safer IDEST visual inspection. In February, a British Standards Institute (BSI) meeting was held in Pretoria, South Africa, to deal with 130 amendments to standards. Only 58 standards were covered, and a follow-up meeting was scheduled for late April 2017 (as this issue goes to press). The British Sub Aqua Club (BSAC) sponsored Gavin Anthony, a forensic scientist specialising in the testing of diving equipment, to attend this meeting. Anthony was the only scuba specialist in the room. He advocated against this standard, asking for the evidence that shows annual visual testing will make diving safer. There has been a lot of talk, but no solid evidence has been forthcoming. The United Kingdom voted against the standard, but was outvoted. However, the final content of the standard is not yet fixed and IDEST is still pursuing a proposed amendment to the recommended interval for internal visual inspections. In the meantime, IDEST has not seen any evidence that this change is necessary nor would proportionately increase safety and so, with the support of SITA and the UK recreational and technical diving industry, is against an increase in the frequency of inspection for diving cylinders. And IDEST has got data proving that the 30-month visual inspection is satisfactory. It has been monitoring why cylinders fail. IDEST’s data confirms that a small percentage of cylinders fail because of internal and external rusting. However, 75 percent of failures are caused by thread issues. Given that 75 percent of failures are due to thread wear or damage, what is the logic of increasing the frequency of removal and refitting? The reason that the UK recreational and technical diving industry has been safe up until now is that, thanks to the likes of IDEST, there is a thorough periodic internal inspection regime that encompasses thread gauging. It stops mismatched valves and cylinders being dived (where the valve has one size thread and the cylinder has a different-sized thread and an untrained person has screwed the two together). And where cylinders and valves fail the thread gauge tests, they are taken off the market and destroyed. If the use of thread gauges is not part of a visual inspection, it will cause issues. “You cannot just look at a cylinder valve and say ‘this is ok' ” Tony Marshall, IDEST. ISO standard. The adoption of the ISO standard is automatically undertaken by the countries that signed up to the Vienna Agreement in 1991, and this includes the United Kingdom. Consequently, this would apply whether or not the country is in or out of the European Union, because the decision to comply with the Vienna Agreement is one made at governmental Ministerial level. In the meantime, the whole of the United Kingdom’s recreational and technical diving agencies, along with SITA and IDEST, continue to advocate on behalf of UK divers and explore alternatives to the proposed testing changes. One possible route is via a risk assessment. Not all pressured cylinders are treated the same way in the United States. Diving cylinders are classed as “sport and recreation.” They are not classed as “commercial cylinders.” Therefore, the UK recreational diving industry has been discussing the idea of introducing a risk assessment alternative for domestic cylinder use with the UK dive training agencies. However, divers may have to prepare for an increase in cylinder inspection frequency if this is not successful.